For the first time, scientists from the Friedrich Schiller University in Jena and the Senckenberg Research Station for Quaternary Palaeontology Weimar conducted a detailed comparison of the mechanical properties of mammoth ivory from the Siberian permafrost soils and the ivory from modern African elephants. In their study, published this week in the journal Scientific Reports, the team of scientists shows that, due to its exceptional material properties, the mammoth ivory was ideally suited for the manufacture of Ice Age hunting weapons – a fact that was also taken advantage of by big game hunters during the Palaeolithic in Central Europe. Spiral-shaped tusks of varying sizes are certainly the most impressive and visible characteristic of the mammoths. These proboscids, which became extinct with the disappearance of the Ice Age mammoth steppe, used their permanently growing tusks with a length of up to 3.5 meters and a weight of sometimes over 100 kilograms as a status symbol and a weapon, but also as a tool, e.g., to break open frozen watering places. Grooves and facets on the surface of the Ice Age giants’ teeth are evidence of their powerful use, which frequently caused the tusks to splinter, yet only rarely led to broken teeth. “It required particular mechanical properties to allow growing teeth of such an imposing length. After all, about two thirds of the tusks freely extended from the upper jaw, thus being directly subjected to the animals’ highly dynamic body motions. We were curious to understand the exact workings behind this,” says Prof. Dr. Ralf-Dietrich Kahlke of the Senckenberg Research Station for Quaternary Palaeontology in Weimar, explaining the purpose of the joint interdisciplinary project. 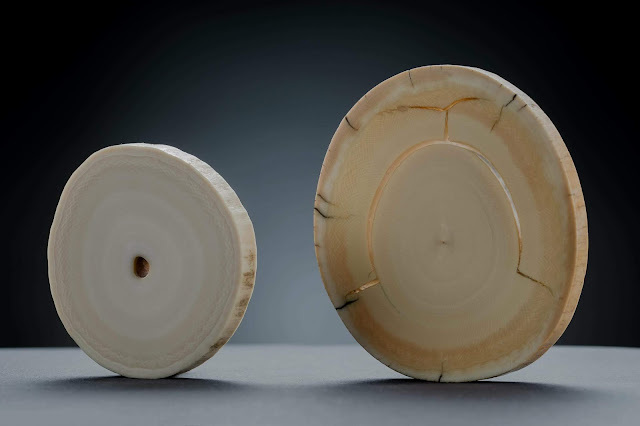 The results show that the composition and mechanical properties of mammoth ivory from the Ice Age permafrost and ivory from the tusks of African elephants are practically identical. The exceptional dental material is characterized by an ideal combination of rigidity and toughness. During the cold periods in the Ice Age, ivory was therefore a perfect raw material for the manufacture of hunting weapons, particularly for highly effective projectile tips. Moreover, compared to other Ice Age materials such as reindeer antlers, the pearly-white mammoth ivory has a much higher esthetic appeal. “Perhaps the carriers of ivory weapons during the Ice Age displayed their shiny equipment with a measure of pride. It is quite possible that the material thus began to be seen as a status symbol as well,” according to the researchers’ speculations.